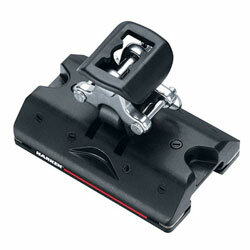 Harken 27 mm midrange car stand-up toggle with ears. Constructed from one piece of aluminum for maximum strength and reliability. Torlon® ball bearings run on machined aluminum hardkote-anodized races for smooth trimming and easing. Modular design gives you the flexibility to choose or change the purchase you need to trim your sail. Stainless steel wire guides keep balls captive when the car is off the track.